While turkey is the usually considered the centerpiece of any Christmas dinner, it’s the trimmings that actually make the meal. And this year, supermarkets and food brands have gone above and beyond to add their own indulgent twists to all of our favourite Christmas foods. While some have tackled festive staple mince pie with Asda’s giant mince pie and Aldi’s recipe infused with salted caramel, other have gone for Christmas dinner favourite pigs in blankets, with Aldi’s foot-long pigs in blankets and Tesco’s ‘pigs in duvets’. 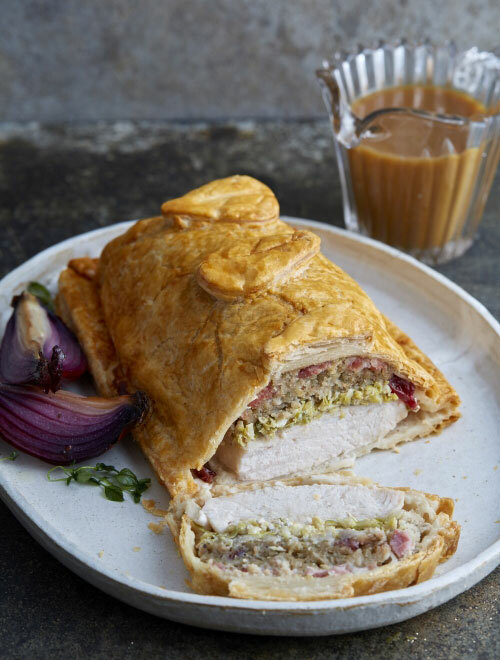 Aldi even took on the whole Christmas dinner with their Christmas dinner wellington, which is a golden puff pastry case filled with turkey, sprouts, stuffing, bacon and bread sauce. Heavenly! And, now one household name has done a twist on the nation’s favourite trimming. There’s no denying that Aunt Bessie’s is Britain’s queen of Yorkshire puddings, with most households having a bag of her frozen, golden goodies on standby in the freezer for a Sunday lunch. Well, now you can get Aunt Bessie’s Yorkshire puddings in a wrap. Unlike other Yorkshire puddings wraps that come pre-made, like EAT’s on-the-go wrap and Lidl’s frozen family meal, Aunt Bessie’s wraps come as a plain base, so that you can fill them with whatever you want. So ,while you can go for classic meat, trimmings and gravy, you can also use it with your favourite lunchtime sandwich fillings or even swap out your tortilla wraps on Mexican night for a bit of golden goodness. If you want to get extra creative, you can leave the Yorkshire pud as a base and top it with your go-to pizza toppings for a Yorkshire pudding pizza. Roast dinner and pizza night all in one? The dream. For only £1.50, one packet comes with two bases so you could even try one of each. The innovative wraps are available to buy from Morrisons in-store and online and available now. We can’t wait to get our hands on them!